Tika Sumpter stars as a former National Security adviser to the Vice President (Jamie Lee Curtis) who retires to a small college outside Chicago. Infamous four creating a plan that spawned a new American policy regarding terrorism, she just wants to write her story and be forgotten. However the sins of her past come to call as those in the college are wary of her, a student begins to stalk her and the Vice President is trying to determine whose side she is on. 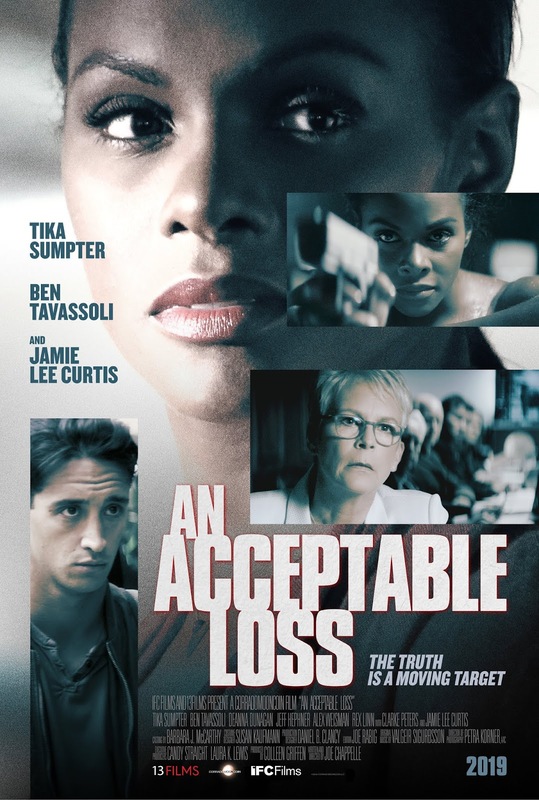 A slow burn thriller with echos to the run up to the Iraq War AN ACCEPTABLE LOSS actually is a film with a more serious warning on it's mind:What exactly are acceptable losses? The plan Sumpter's character comes up to make the world safe is not only horrific, but doesn't achieve what it intended. Where does the madness end? Why are the small personal losses more devastating that large faceless ones? More importantly the film shows us what happens when mistakes are made, mistakes we can't take back. You have to be willing to go with the film for it's first half which reveals the backstory in little bites. There are hints in conversation and flashes of memory come when Sumpter is writing but it isn't until we are about an hour in- just as the film goes into over drive- that we know what happened and why Sumpter is viewed with disdain by so many. AN ACCEPTABLE LOSS is a thoughtful and timely film that also manages to be a killer thriller. Once the film finally explodes the film shoots to the wind with no one and nothing safe. Once we are belted in the film just goes and doesn't let up as its twists and turns are often unexpected. Hitting theaters in New York and VOD this Friday and theaters in the rest of the country next week AN ACCEPTABLE LOSS is recommended for anyone wanting a solid political thriller with a brain behind it.